Last night it was announced that Craig Ferguson will be ending his run as host of CBS’ Late Late Show. Ferguson is yet another falling domino in the chain that began with Jay Leno’s not-entirely-voluntary retirement from The Tonight Show earlier this year. And as much as I’ll miss Ferguson, his robot skeleton sidekick and his Doctor Who fixation, it’s really the also-retiring David Letterman I want to write about here. Even though Johnny Carson was the late night host of my childhood, I was truly a Letterman kid. I loved it when he filled in for Johnny, and eagerly followed him on his brief, ill-advised stint on a morning talk show during the summer of 1980. Of course, it was on his own Late Night that he became the Letterman we all came to know, his show an exercise in surreal experimentation . While Top 10 lists and Stupid Pet Tricks remain his signature bits, what fascinated me were such stunts as his succession of unusually-mounted cameras (e.g. the Late Night Monkey Cam) and a regular bit in which he dropped a variety of objects from the roof of a five-story building. Chris Elliott showed up in a variety of guises, my favorite being a vaguely sinister man who lived beneath the audience seats. 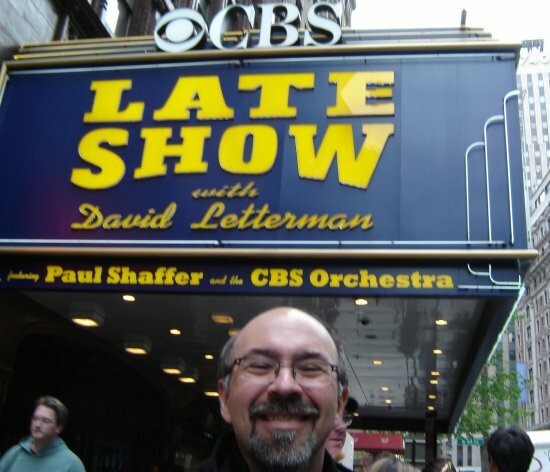 I was a huge fan of Letterman’s theme shows, such as the ones in which he allowed the audience to vote on various production aspects of the episode, changing the theme music or the backdrop behind his desk. Then there were the “international” episodes featuring such dubious talents as Kamarr (whom Letterman nicknamed “the discount magician“). But one of my all-time favorite episodes of television was the “360-degree rotation show,” during which the picture imperceptibly turned through one full rotation over the course of the hour. So many Late Night moments have stuck with me: elevator races, the “General Electric handshake,” Paul Shaffer’s “Bermuda” song (“it’s a cuckoo kind of place”), Dave’s chats with Meg in the window of the building across the street, and Larry “Bud” Melman handing out hot towels at the Port Authority. Much of that was lost when Letterman moved to CBS and (more significantly) an earlier time slot. The rough edges were sanded, the weirdness toned down to suit a general (older) audience. Dave himself became older, crankier and less willing to leave the studio. Which is not to say that CBS’ Late Show wasn’t essential viewing at times. Letterman wasn’t afraid to toss tough, challenging questions at political guests, and his post 9-11 speech was one for the ages. But as much fun as it was to hang out with such found-talent as Hello Deli owner Rupert Jee, the anything-can-happen quality of Late Night was lost. Conan O’Brien, Dave’s successor at NBC, kept the freak flag flying for a time, as has Craig Ferguson, with his cursing hand puppets and pantomime horse cohort. When Craig and Dave hang it up later this year, it really will be the end of an era. Happily, Vicky and I had a chance to see the Late Show in person during our 2012 New York trip, and as you can see above, we got the full experience, including lunch at the Hello Deli. To have that crossed off our bucket list is especially comforting, now that Dave’s late night days are numbered.